Having grown up in the semi-desert of North Central Washington, I spent my childhood in awe of the lush, green beauty of Western Washington. In 1999, living in the high desert of Arizona, I secured a promise from Mr. M that after we left the military, we would move to that area. Upon leaving the military in 2002, however, we chose to relocate to Indiana to attend school in a lower cost of living area and spend time with Mr. M’s family. When the time came for us to move to Seattle in 2006, Mr. M was fairly certain that the colder weather and greyer climate wouldn’t be a good fit for him, but I was convinced that given enough time, he would become enchanted with the Emerald City, just as I had so many years earlier. With a commitment that we could leave Seattle for a more suitable area if after two years Mr. M wasn’t happy, we hit the road in our Uhaul bound for the Evergreen State. With the economy booming and Mr. M and I both holding secure long-term jobs in government and banking in late 2006, we purchased a home southeast of the city. Sigh. Seven years later, our commute times are on average an hour and a half each way, our house is worth about 2/3 what we purchased it for and our kids are spending WAY too much time at daycare. Mr. M is miserable with the cold, damp, grey climate six to nine months out of every year and S feels guilty for not giving enough time to the girls. Overall, the situation isn’t sustainable so S suggests selling the house at a loss to move closer to the office. Mr. M is enthusiastic and happily agrees to move to Tampa. S begins a WHOA, WHOA, WHOA that doesn’t sound like Ballard, West Seattle or Issaquah tap dance then spends a few weeks wrapping her mind around the idea of “not Seattle”. Several weeks later, Mr. M and S embark on a very tedious and time consuming journey to discover what criteria to consider in their new home. Making the top of the list were clean air (due to C’s asthma), close proximity to Children’s hospital (due to C’s asthma), state school rating greater than Washington State schools, average to low cost of living, average to low unemployment, medium to medium-large sized city, more average days of sunshine and warmer climate. With a map of the US in front of us, we crossed off metro by metro until we we left with only a handful of locations with Charlotte and Raleigh North Carolina as the front runners. Having never been to North Carolina, we both felt the research was leading us to Raleigh, but wanted to visit the area to confirm what we’d discovered online with our own eyes. With the help of friends in the area, we mapped out an itinerary to learn all we could about Charlotte and Raleigh over the course of a week and guess what – we are GREAT researchers! Raleigh was everything we hoped for and more. With a goal of being in the Triangle with 18 months or so, we put our house on the market and started putting out feelers for jobs. 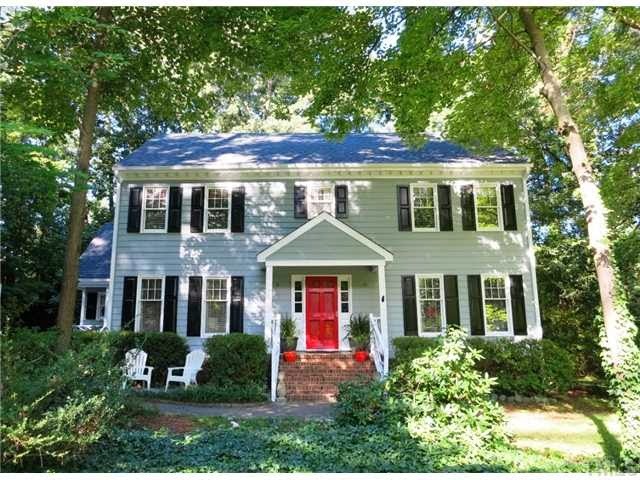 Within a 36 hour period, Mr. M had a new role, we’d sold our house and had an offer accepted on a house in Raleigh! It seems as though Mr. M, Mrs. S, C and A will be Tarheels by Thanksgiving.